Probably a month or so too late, I never got to summarize my year in meals (more like the most interesting things I ate and experienced) for 2010, but I figure it's the quintessential thing for a blogger to do at the end of the year and/or at the beginning of a new year. Let's just say I'm doing it for the Lunar New Year, so I won't sound like such a slacking blogger :P.
First, I finally got around to starting the food blog that I've always imagined myself maintaining, and I've stuck to it since March/April of last year! I even thought I came up with a super clever name, Four Tines and a Napkin, to add to the pretension and gourmandise I anticipated to share in the blogosphere. I introduced Marcus to French macarons at Madeleine Patisserie (now La Maison du Macaron), and he couldn't resist ordered every flavor during our second visit. 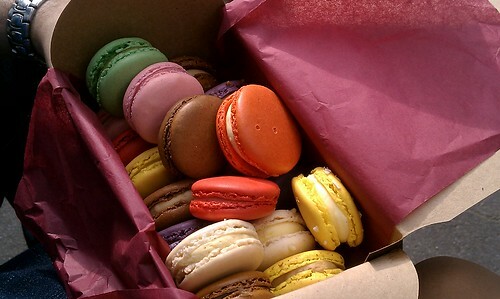 So we ended up eating through a box of 22 macarons together, resulting in a deep, dual sugar coma after filling our stomachs with these French delights. Needless to say, we skipped dinner that night and breakfast the next day. 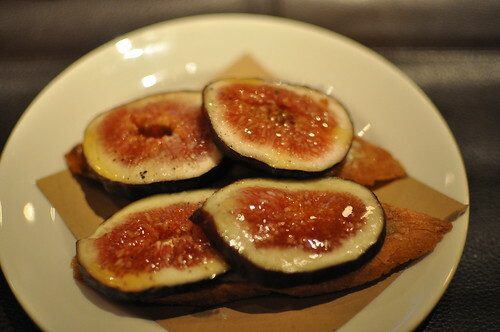 Linda introduced me to Danny Meyer's trattoria, Maialino, late last August, and I fell in love with this crostini di fichi, that is crostinis topped with Black Mission figs, Robiola cheese, and sunflower honey. I enjoyed it so much (I recall calling it a culinary synecdoche of flavors, haha) that I tried replicating it during dinner one night with Marcus, finding the ingredients at Whole Foods. It was a successful dish, and I will definitely be using it for any friendly gatherings in the future! Linda also invited me to go to a "farm dinner" hosted by Outstanding in the Field and Print. restaurant in Alphabet City. 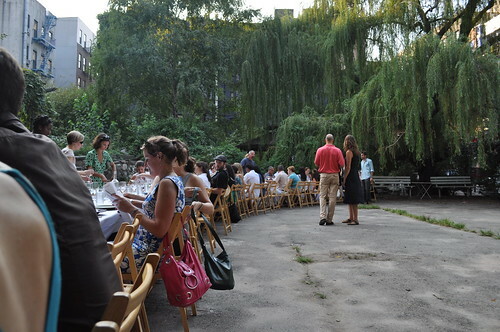 It was a meal that consisted of all local ingredients and resources, and we all ate a long, communal table. 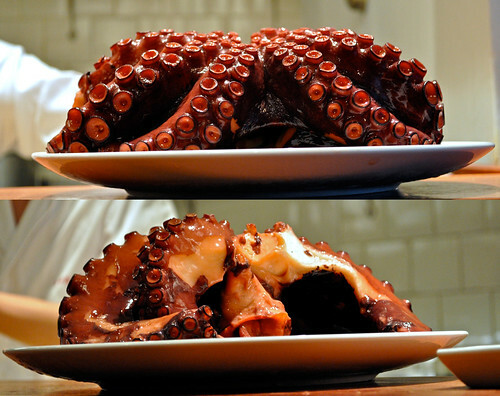 Marcus and I had some really amazing octopus (tako yamarakani, to be exact), one that was slow-poached by Chef Masato Shimizu of 15 East on his birthday. I finally made it (after countless busy signal phone attempts) to the one of the many gastronomic meccas on my foodie bucket list (and subsequently crossed it off the list in utter happiness and excitement) in Chicago: Chef Grant Achatz and Nick Kokonas' Alinea, marking the best meal I've ever had to date. 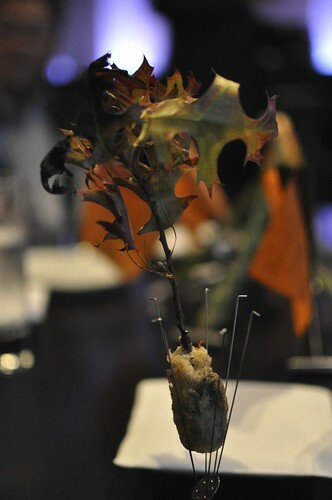 Please read about my visit to Alinea, if you haven't already--I'm very proud of it! I spent a long, dedicated two weeks drafting it, doing research and finding the right words to describe the experience as accurately as possible. 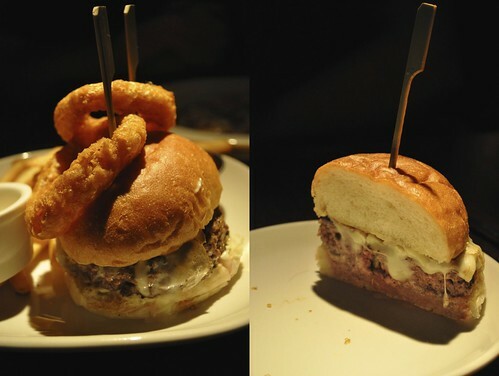 Marcus and I had many bites of Chef Josh Capon's white-truffle-infused "It"-burger at Burger & Barrel that I still continue drool about during the day and dream about in my sleep. Such a rich delight to have sat in my spoiled stomach this year! 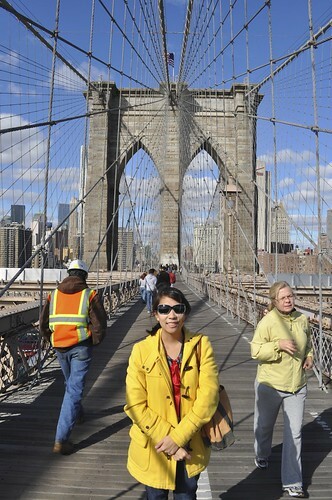 I walked the Brooklyn Bridge with Marcus this past fall (something I've been meaning to do for the longest time) to pay a visit to Grimaldi's Pizzeria. It was a really nice walk, and the pizza was a nice post-walk treat! 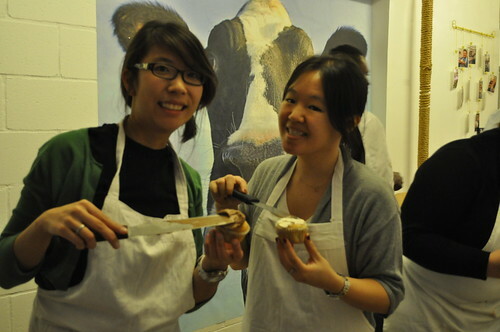 Alice and I took a cupcake baking class (courtesy of a Groupon) at Butter Lane in November! We learned how to make banana cupcakes and took home a dozen of cupcakes made during class by us and our classmates that night! 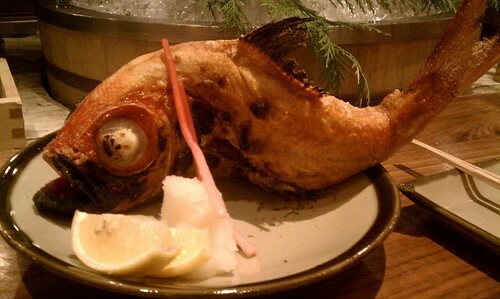 At Inakaya, Marcus and I confirmed our love for kinmedai (golden eye snapper), where we had it served whole, big round eye and all. And that, ladies and gentlemen, is 2010 for Four Tines and a Napkin.